BROCKTON, Mass. 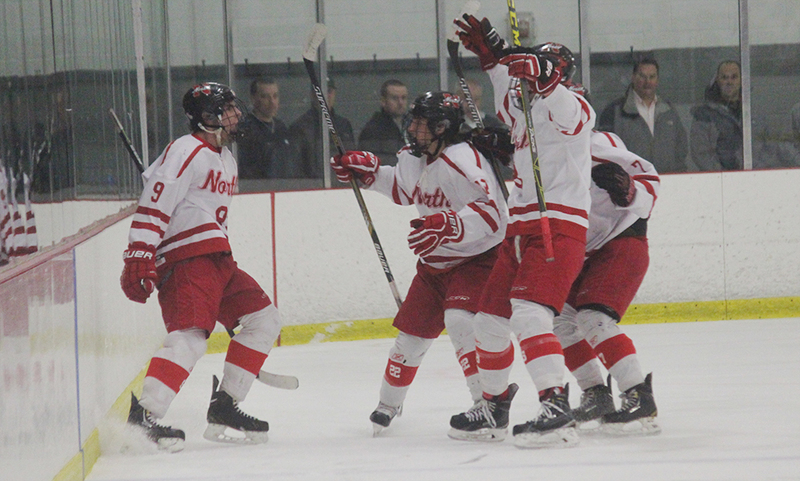 – Stoughton was outshot 13-1, but somehow came through the opening period against Div. 2 contender Bishop Feehan with an improbable one-goal lead. All of the momentum from scoring late in the first and the energy from celebrating Senior Night was lost in the opening 45 seconds of the second, as the Shamrocks stormed back to take the lead. 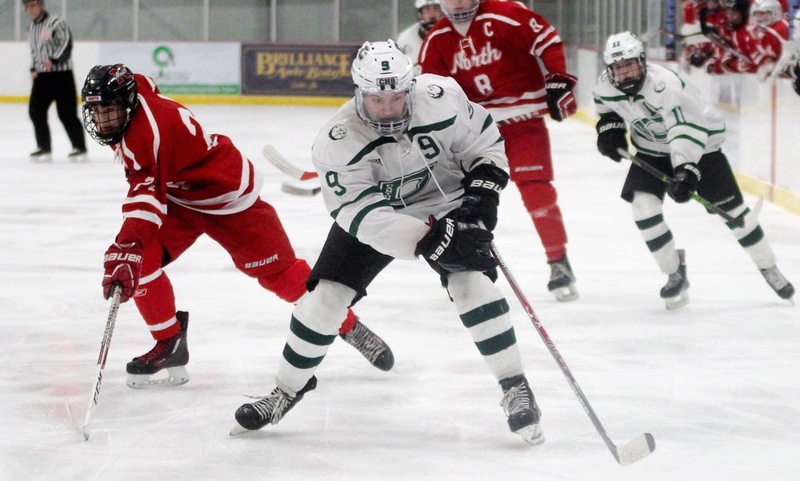 The Black Knights gave up four goals in the second and were not able to recover, as Feehan skated away with a 5-1 victory on Saturday afternoon at Asiaf Arena. “The second period has killed us all year,” said Stoughton coach Dan Mark. “If I was to look at the statistics, I’d say almost every game we’ve been killed in the second period. I don’t know what goes on with these kids. The Shamrocks were heavy favorites coming into the game and were looking forward to making a push in the competitive Div. 2 South bracket. Feehan played like the favorites early on and peppered freshman goalie A.J. Scott with 13 shots in the first alone, but were unable to find the breakthrough. With 3:40 left in the period, Stoughton shocked the Shamrocks by taking the lead. The Black Knights had been limited to mere seconds of puck possession in the attacking zone and had yet to record a shot on goal when senior Mark Sheehan slid a pass across to freshman Carter Gerome and he knocked it past the Feehan goalie to make it 1-0. Heading into the locker room, the Shamrocks were left shaking their heads and wondering how it was possible to be behind. When they got back on the ice, it did not take them long to change that. 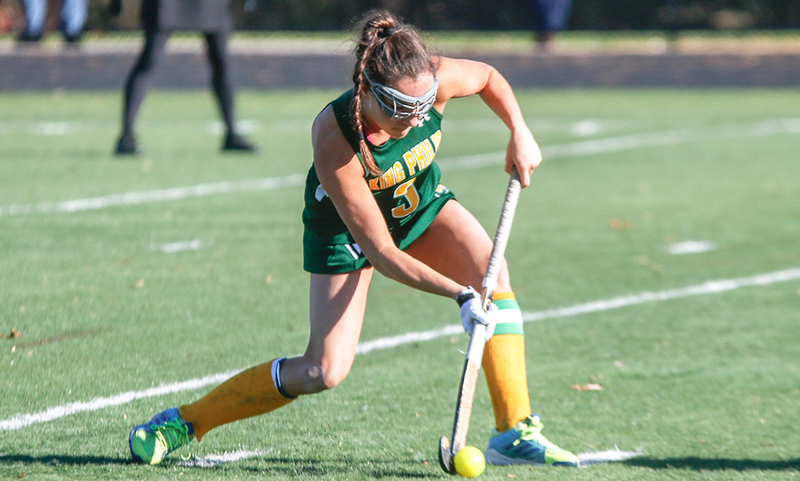 Feehan scored two goals on its first two shots inside the first minute of the second. Four minutes later, the Shamrocks made it 3-1 with a power play goal and then tacked on a fourth four minutes later. Feehan outshot Stoughton 20-5 in the second, with most of the shots by the Black Knights coming in the final couple minutes. Despite being dominated, Stoughton came out in the third and started to create openings. Sheehan in particular was able to create scoring opportunities with his speed. The Black Knights had a pair of good chances while down by three but could not find the back of the net. With 7:22 left, Feehan wrapped up the win and the two points with the fifth goal, but that took nothing away from the play of Scott, who made 40 saves in a losing effort. “He’s been fantastic all year,” said Mark of his freshman goalie. Although it was a night to honor the six seniors, Stoughton could also look to a promising future with freshmen like Scott and Gerome putting in solid performances. Following the game, Mark took a minute in the locker room to honor Sheehan, who had been voted the Hockomock League MVP by the coaches at their end of season meeting. 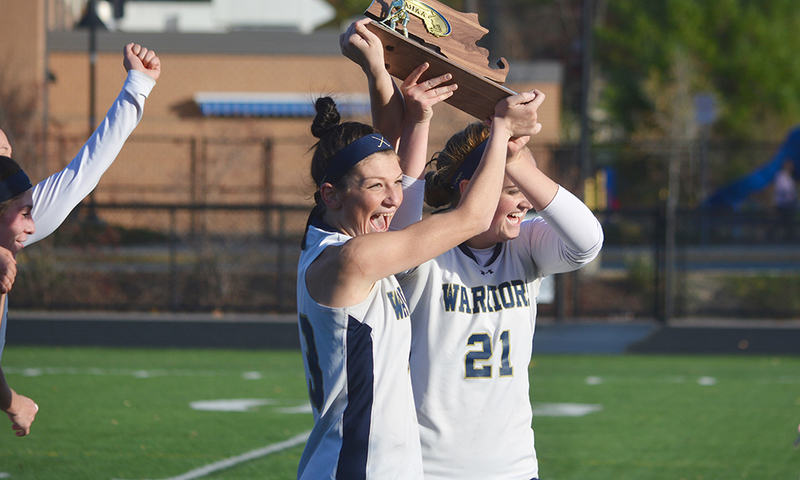 It is the second time in three seasons that a Stoughton player has won the MVP vote, as P.J. Sheehan took the award in 2014. 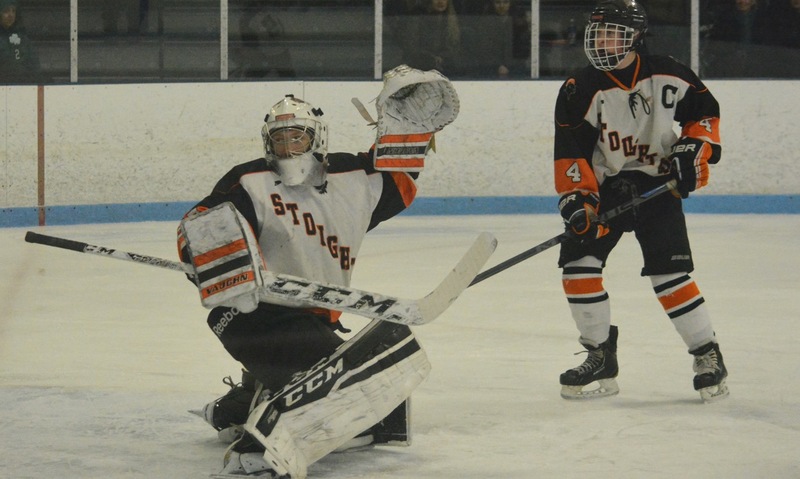 Stoughton (6-11-3, 4-6-0) will close out its season with a trip to North Attleboro on Wednesday. TAUNTON, Mass. 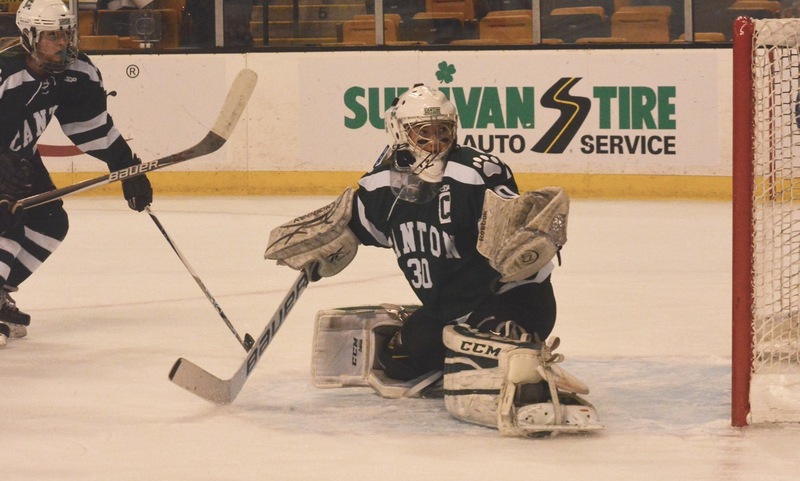 – Though Stoughton was significantly out skated for the majority of the opening period, the backstopping of AJ Scott and an explosive second frame from Mark Sheehan allowed the Black Knights to capture a 4-1 win over Attleboro on Saturday. Trailing by a goal after a first period in which the Black Knights were outshot 14-2, Sheehan went to work to erase the deficit. Similar to his game-tying goal in a win against Taunton last week, the senior captain hustled into the offensive zone, cut through the defense and slid the puck past Attleboro goaltender Tim Gile (13 saves) to even the score. Later in the second, Jon Lessa sealed in a clearing attempt at the line and fed it down low to Nick Hardy, who ripped a wrist shot past Gile to give Stoughton the lead. Just over a minute later, Sheehan netted his second of the game to add some insurance for the Black Knights. 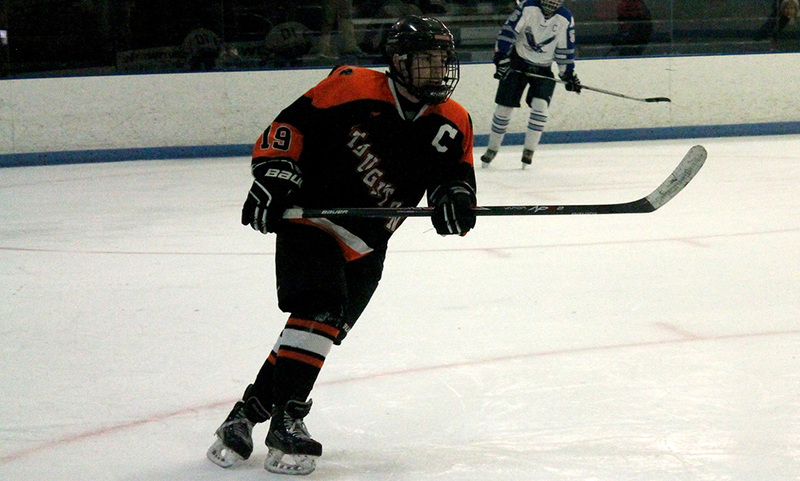 Stoughton flipped the script on Attleboro in the second, outshooting the Bombardiers 11-1 in the period. Sean Doherty added a late goal for Stoughton on a two-man advantage to seal the win. Doherty also had two assists in the game while Sheehan and Lessa each had a helper. Despite collecting 14 shots in the first period, Attleboro could only solve Scott once. About five minutes into the game, Sam Larkin buried a rebound from a Cam Littig shot to capture the early lead. But Scott, who finished with 20 saves, kept his team in the game until they could figure it out offensively. With its second league win in three games, Stoughton hockey improves to 6-10-3 overall, 4-6-0 in the league, and will have a week off before hosting Bishop Feehan next Saturday. Attleboro, now 5-10-2 overall and 1-8-1 in the league, will host Dighton-Rehoboth on Monday. TAUNTON, Mass. – For the second straight year, a late season win for Mark Sheehan and the Stoughton Black Knights denied Taunton a postseason berth. Sheehan scored both of Stoughton’s goals while AJ Scott backstopped a 2-1 win for the Black Knights on Saturday night. Down 1-0 in the second, Sheehan made his way to the left circle and buried a wrist shot to tie the game. Midway through the third, Sheehan anticipated a cross-ice pass from Taunton, intercepted it and finished a breakaway for the game winner. 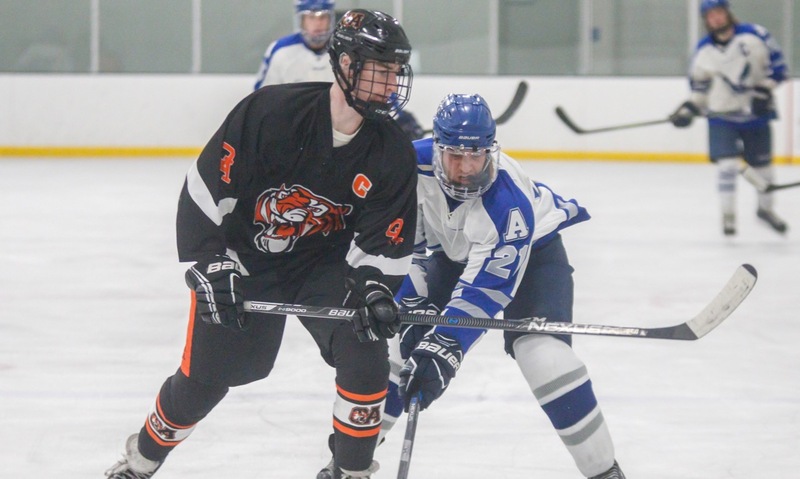 Taunton took an early lead in the contest when Jake Roberts netted a backhander from the slot off a faceoff, but that would be all the offense for the Tigers. 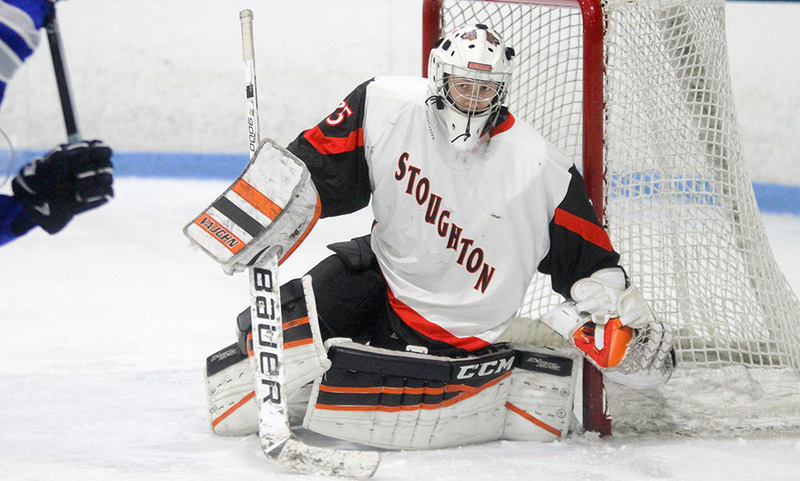 AJ Scott made 31 saves to earn Stoughton the win. Last year, Stoughton picked up its first win of the season and eliminated Taunton from postseason contention with a 4-2 victory in the final contest of the year. The situation is different this year for Taunton, though, as still opportunities remain to reach the postseason. 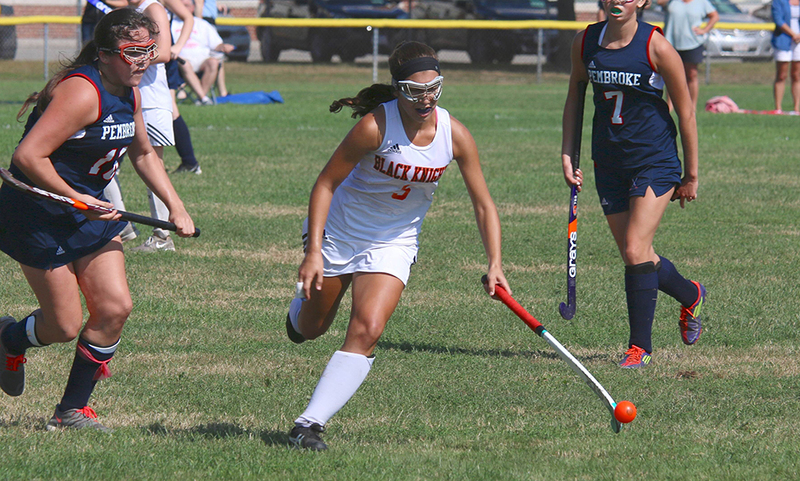 Stoughton improves to 5-9-3 overall and 3-5 in the Hockomock League and will host Franklin on Wednesday at 5:30 p.m. Taunton, now 10-6 overall but just 2-5 in the league, will travel to Fall River in search of a postseason berth against Durfee on Wednesday.